The other day I went past a fast food restaurant with signs up for bacon ranch chicken sandwiches. While the smell of that particular restaurant was far from appealing, I thought the combination sounded great and I had a strong sense of nostalgia for the convenience that such a sandwich would provide. I had this version for lunch today and it was nearly as easy. When I boiled a chicken last night to make stock, I set aside a small portion of the white meat to use today. I like to have a batch of Teri's fabulous ranch dip in the fridge for easy snacking anyway, so whipping up a batch today was something I had planned on doing anyway. We made bacon for breakfast so it was easy to set aside a strip to use for lunch. While it took a little coordinating and planning ahead, it made for a very quick and satisfying lunch (simply combine the ingredients on a lettuce leaf). Hi. 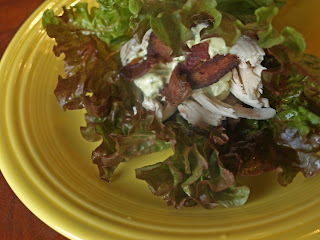 Could you please share a link to Teri's fabulous ranch dip that you mentioned in this recipe? Thanks a bunch! It also looks like there's a hyperlink embedded in the words "ranch dip" above. When I clicked on it, it took me to the recipe, but these things don't always work the way they're supposed to. If you still have trouble bringing up the recipe, you can type "ranch dip" into the search finder, and you should get it. I hope that helps. Happy dipping!